This is the eleventh in a series of posts containing PDFs of texts that may be of interest to those studying Albanian socialist realism. I am still in the process of planning several posts with actual content—that is, analysis, rather than simply more scanned texts—but they are still some ways off, so I’m going ahead and posting more scans for the time being. Today’s (again, rather short) post contains selections from the November 1956 issue of Nëndori. The selections discuss the creation of the collective organization “The Union of Albanian Writers and Artists” [Lidhja e Shkrimtarëve dhe Artistëve të Shqipërisë] Formerly, the two organizations—the Union of Writers and the Union of Artists—had been separate, and the issue contains the text the text of the decision announced by the Council of Ministers to unite them under one roof. Also of interest is the “Kronikë Kulturale” section from the back pages of Nëndori, which briefly details, among other events, the opening of the first exhibition of Soviet art in Albania (and also the first exhibition of foreign figurative art in the country, according to the editors). The show opened in Tirana in October 1956, in the premises of the “Society for the Friendship of Albania and the USSR” [Shoqëria e Miqësisë ‘Shqipëri—BRSS’]. This is the seventh in a series of posts containing PDFs of texts that may be of interest to those studying Albanian socialist realism. Initially I had planned to write thorough descriptions and analyses of the content of the documents, but I barely have the time to scan them, much less write extensive commentaries. Today’s text is the complete volume Letërsia dhe Artet në Dritën e Partisë (1975), by Razi Brahimi, one of the principle literary critics during the time of socialism. The work won the first prize in the literary-artistic competition devoted to the 30th anniversary of Liberation. For historical purposes, the timing of Brahimi’s sweeping analysis of socialist culture in Albania is interesting because it appears relatively soon after the (in)famous 4th Plenum of the Central Committee, in 1973—an event which is traditionally understood to represent the end of a period of relatively liberal ideas on culture and politics, marking the beginning of a shift towards a decidedly stricter dichotomy between Albanian socialism and “foreign influences.” (Hoxha’s oft-quoted speech on the occasion was entitled “Të Thellojmë Luftën Ideologjike Kundër Shfaqjeve të Huaja dhe Qëndrimeve Liberale Ndaj Tyre” [“To Deepen the Ideological Struggle Against Foreign Influences and Liberal Attitudes Towards Them”]. One way to read Brahimi’s book, which concludes with a bibliography mapping Hoxha and Ramiz Alia’s relevant works on culture up till that time, is as a kind of guidebook for post-4th-Plenum aesthetic criticism. As such, its overarching summary of the role arts and letters have and should play in the context of socialist Albania is decidedly valuable for historians. Among Boris Groys’ most famous formulations is that of socialist realism as “a style and a half,” occupying a middle position between the modernist avant-garde of the early 20th century and the postmodernist ironic eclecticism of the latter part of the century. Indeed, reading Groys—still probably the most oft-cited Western theorist of socialist realism—one has the impression that the acceptance of socialist realism [hereafter: socrealism] as a legitimate subject of study is based firmly (and solely) upon its role as theoretical, political, and visual fodder for the subsequent Moscow conceptualists and heroes of Sots Art. Groys’ analysis of socrealism has been the subject of a number of critiques, both in terms of its reading of the relationship between the avant-garde and socrealism and its reading of the relationship between socrealism and postmodernism, and my purpose is neither to summarize these critiques nor to add to them. Rather, I would like to pose a question that might seem to some to be straightforward and even retrograde: What can we say about Modernism after Socrealism—in the case of Albania in particular? In a history of styles, how do we do justice to modernist paintings done in the wake of the system of socrealism? How does socrealism change the relationship between modernism and postmodernism? Is such a ‘belated’ modernism a style and a half? Half a style? 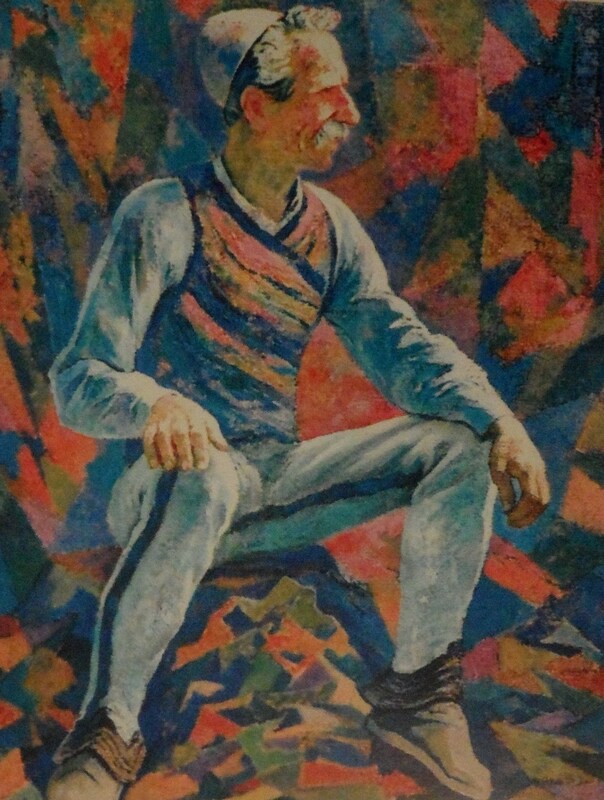 The corpus I want to understand is not so much those ‘modernist’ paintings done in Albania during the period of socialist control, during which socrealism as the mandated style—and which were often ether condemned or kept secret, but which in some cases were celebrated as exemplars of socialist art. Instead, I am concerned with how we might understand the art (and in this case, I am most concerned with painting) created in the late 1980s (after Enver Hoxha’s death in 1985), the 90s, and the early 2000s that might be described as ‘modernist,’ much of it created by artists who began their careers as socrealists. (I use the term ‘modernist’ here in the vaguest and most uncritical sense, as a descriptor for art that tends towards abstraction [though it is still often figurative]; is concerned with formal experimentation more than content; and often embraces subjectivity or universality, or both in spite of their apparent contradictions.) What can we say about this art and its stylistic significance? What do we say about Zef Shoshi’s (seemingly unending) images of Zadrimoret ? About Vilson Kilica’s colorful surrealist landscapes? The question will, no doubt, be uninteresting to many readers, and I should like to elaborate some of the potential objections to this investigation, if only to make it clear what I am not concerned with understanding or criticizing. First, of course, one could ask: what is the use of trying to fit a belated, post-socrealist, pre-postmoderist modernism into a history of styles anyway? Hasn’t the history of styles long been an implicit enemy of the study of non-Western modernisms (and even of early-20th-century American modernisms), since it often inevitably privileges teleological narratives of the purification of stylistic paradigms (in regions where artists nearly always mixed the most diverse styles), not to mention continually drifting close to the trap of tying visual properties to ideological schemas in stable systems? Aren’t we art historians well and truly done with such a formalist enterprise, and aren’t we better off for it? The answer, I think, is no on both accounts. I will not fully elaborate all of the reasons for the continued relevance of this question here, but one is of particular significance here: the history of styles is a global history, and it is a history of abstract ideas as much as of localized agencies, forces, and differences. The well-founded critique of the global history of styles is that, at best, it misses the specificities of the local and, at worst, it subsumes local specificities to dominant (Western) paradigms. Unfortunately, this critique often takes the form of a call for histories ‘radical contextualized,’ which both assumes that such contexts are actually and significantly present for particular works of art and often paradoxically implies that the only way to recover the importance of marginalized art histories is to discuss them on a political, social, and visual level almost totally divorced from that of the global history of styles. Insofar as I am quite interested in the specificity of the Albanian case, I am here also interested in using it to help tell a much broader story about the temporal emergence of modernism and its possible chronological positions in a history of styles. The second objection (or set of objections) that might be raised to the investigation of post-socrealism Albanian modernism as modernism is that this approach 1) heroizes modernism as the escape from the artificial confinements placed on painting under the socrealist system; 2) perpetuates the idea of a country like Albania as ‘behind’ in the global cultural trajectory, since it has only recently produced modernist painting; 3) [the implicit corollary to the previous objection] reveals that there is nothing much of interest in such painting from a stylistic point of view, since it only repeats what has been done before elsewhere (at best it is significant in a ‘radically contextualized’ political-artistic history; and 4) devotes too much attention to a (be)late(d) modernism and ignores the very real work to be done on modernist painting in Albania before the advent of socrealism. Against this set of objections I have little to say except that they represent points of views and approaches that are not immediately of interest to me. What I am interested in is the possibility of discussing modernism as something ancillary to socrealism in both a chronological and a conceptual sense, something that builds upon socrealism rather than being distorted or erased by it. Furthermore, I am interested in thinking more critically about how modernism-after-socrealism might continue to serve a real stylistic political function in a time when critical attention is more squarely focused on both ‘postmodern’ and ‘contemporary’ art. I doubt that many would insist that modernism (or, let me say for the moment, Modernism) is insignificant in the current and recent Albanian political context (and argue instead that the Albanian politico-cultural context is purely ‘postmodern’). Modernism’s current relevance—both stylistically and philosophically—is continually reaffirmed by debates surrounding public aesthetic policy in Albania, from the designs for the 2012 Monument to the Anniversary of Independence, to the aesthetics of projects like Bunk’Art, to Edi Rama’s own state-as-a-work-of-art political paradigm. No amount of metacommentary (of the kind, for example, represented by Anri Sala’s documentation of Rama’s projects) can completely displace recent examples of public art from the realm of modernist aesthetics into the realm of postmodernist post-aesthetics. However, I hope that my present argument amounts to saying more than “We—or at least, Albanians—are still in Modernism; we never escaped it” (a decidedly unsatisfactory assertion at best). The traditional art historical trajectory sees the formalist concerns of modernist painting (as abstract expressionism, or as art informel, for example) in terms of an escape from the explicitly political contexts of the wars and subsequent totalitarian states, and a new kind of traditional reading of socrealism credits its explicit politicization of aesthetics with the postmodernist realization that ‘everything is political.’ What would it mean, however, to set alongside those general accounts of stylistic trajectories, and to take seriously, these three propositions: 1) Socrealism (as a realism) can predate modernism. Alternately, it can come into being as an early, embryonic form of modernism rather than a late one; it can be “half a style” and not only “a style and a half.” 2) Positioned at in the earlier stages of modernism, socrealism is not so much partially responsible for the political awareness of postmodernism as it is partially responsible for the political awareness of later forms of modernism. In other words, it is not simply that socrealism inherits the philosophies of the avant-garde: it also forges the avant-garde. 3) With and in contrast to 2), socrealism doesn’t just help to create the collective, politically-aware positions that characterize some postmodern artistic practices; it also helps create the possibility of the modern artist as individual creative subject. This creative subject can be alternately conceived as radically political (a politician-artist like Edi Rama being a [perhaps worn out but still quite accurate] prime example), or as apolitical and ‘free’ from social pressures. This third proposition in effect reverses the implicit logic of Denis Picard’s quotation used to introduce my essay: there (in quite a cliché manner, but that does not mean it is any less critically relevant) the “pure and subjective” vision of art as an “individual problem” is considered primary, and any “collective” distortions are subsequent. Instead, let us entertain the possibility that socialist realism does not construct a collective aesthetic epistemology (for example, by effacing, subjugating, and distorting a more primordial individual artistic subject-position), but instead generates the individual subject, and with it the style of the individual artist, as something secondary. Thus, the modern (or Modern) artist is the supplement of socrealism, not the reverse. Socrealism is not always something added on en route to postmodernism; sometimes it is modernism that is added on. To a certain extent, taking seriously the model I have suggested here amounts to a structuralist reading of art history, where modernism and postmodernism always exist as stylistically or thematically distinct possibilities that need not conform to any teleological progression. I am certainly not opposed to such a framework, and I think it moves beyond certain teleologies that—no matter how much we insist they have been debunked—still guide the writing of 20th-century art history. However, I also want to suggest—in my use of the Derridean vocabulary of the ‘supplement’—that a reassessment of the chronology of modernism, socrealism, and postmodernism does more than enrich our understanding of a structure: it also destabilizes and redoubles a set of conceptual and aesthetic categories that (and here the ‘radical contextualization’ will slip back in) have too often been considered primarily in the context of Western Europe, Russia, and/or America, and only secondarily (supplementarily) in places like the Balkans. This destabilization might result in a fresh set of questions regarding the presence or absence (read: the interiority or exteriority) of modernism, socrealism, and postmodernism to each other both in the 20th century and in the 21st—questions that the chronological placement of socrealism as “a style and a half” cannot ask. What would it mean to write socialist realism as the effaced origin of a (be)late(d) Modernism, and to see that Modernism as interwoven throughout every attempt to go beyond it, every postmodernism? In this context, I think we might find a new significance in the (both valorized and decried) colorful geometric landscapes, abstract partial torsos, and Fauvist folk scenes of Albanian modernist art in the decades around the turn of this century. This might seem a rather unsatisfactory conclusion, but I mean the previous discussion as an incitement to discussion rather than a definitive statement—not least because it seems that relatively little has been said about the (allegedly naïve, at worst hopelessly kitsch) emergence of modernism in the past three decades in countries like Albania. Allow me to close—with a sort of footnote—by returning to Groys, who refers to the work of the Russian ‘postmodernists’ as “post-utopian,” suggesting that the utopia envisioned by the early 20th-century Russian avant-garde was ‘realized’ in a sense by socrealism, and that contemporary artists work in this fallout. Something in this implies (although I do not think this is Groys’ point) a spatio-temporal incompatibility between the failure (or the end) of utopia and the practice of modernist aesthetics…as if modernism can only prefigure utopia and all that comes after utopia is either ‘postmodern’ or ‘contemporary.’ If the interior of the body of Modernism continually—and absolutely—reforms itself, why not consider the utopian dreams of socrealism yet another block of ‘becoming-Modern’? What kind of temporality would we have to conceptualize to envision stylistic modernism after utopia? Qtd. in Vilson Kilica: Një Jetë në Krijimtari (Tirana: Studio Kilica, 2012), 10. See Groys, “A Style and a Half: Socialist Realism Between Modernism and Postmodernism,” in Socialist Realism Without Shores, ed. Thomas Lahusen and Evgeny Dobrenko (Durham: Duke University Press, 1997), 76-90. Of course, Groys is quite explicit that socrealism is a modernism, albeit one “of a very particular kind” (76). Thus, the significance of socrealism is also argued based upon its realization of particular principles inherent to modernism and the modern project or experience more broadly. I use the term ‘belated’ with a great sense of aversion and caution, but I think it is appropriate. While I think the term is often misplaced in discussing developments in Eastern European art of the (earlier) 20th century, there is a sense in which any modernist art coming in the final decades of the century (to say nothing of the 21st) is ‘belated’ not in the sense that it comes after the same developments have occurred elsewhere, but that it comes after developments that elsewhere, it preceded. For example, if it is generally the case that socrealism grew out of and ultimately against modernism, what can we say about modernism that grows out of socrealism and ultimately against postmodernism? These are, of course, extreme positions, and they most certainly should not imply either that all those who seek ‘radical contextualization’ adhere to these ideas, nor that ‘radical contextualization’ is unhelpful. It is. However, as an art historical strategy, it often displays an aversion to overarching discussions of style that are still helpful in understanding art history in the longer view. After all, it is not necessarily likely that subsequent histories of the 20th and 21st centuries will see the shift from modernism to postmodernism as we do, or even that they will see them as distinctly as we do. The quotation at the beginning of this essay is emblematic of this heroization of painters as ‘modernist’ (as opposed to ‘realist’. The implication being that one misses out on what is being done by actually innovative artists if one focuses on those who merely uncritically repeat or dabble in earlier paradigms. This may be true, but it is far more convincing from an aesthetic/art-critical standpoint, and less so from one that attempts to theorize as inclusive a history as possible. The more problematic side of this objection is when it also carries the implication that what we can all agree on is that such belated (or worse, pseudo-) modernist painting from contemporary Albanian painters is bad. I disagree that it is all bad, but that is not the point: questions of style are not all questions of aesthetic merit, and I am not interested in aesthetic merit. Recently, for example, the relationships between the political position of socrealist art and that of contemporary art in China have been discussed by Liu Ding and Carol Yinghua Lu, in ” From the Issue of Art to the Issue of Position: The Echoes of Socialist Realism,” e-flux 5 (2014), available from http://www.e-flux.com/journal/from-the-issue-of-art-to-the-issue-of-position-the-echoes-of-socialist-realism-part-i/ (accessed 1/7/2015). When I say, in the context of Albania, that socialist realism can predate modernism, I do not mean to imply that Albanian culture existed in some vacuum where modernism did not penetrate. This was manifestly not the case, since nearly all of the earliest modern painters in Albania were educated abroad. However, there is a difference between a style being practiced by some and a style achieving heightened significance in society. The point is not that there was no modernism in Albania before socrealism, but that socrealism was part of the development of modernism, and not a break away from that development (either in a regressive sense, or in the sense of prefiguring what would come after modernism). We can of course still be suspicious of this individual creative artist, and the search for his or her origin, but we gain a new understanding of the origin of the myth of such a figure. Of course, the dream of utopia shows up in many ‘contemporary’ works, and I do not think that these works are all (or even mostly) modern. I call this a placeholder in the sense that it represents a set of very preliminary ideas about a topic that I think no one can effectively respond to only a day after it happened. Still, all analyses have to begin somewhere, at some point. Call it a rant, but one that is intended to spur conversation—and to further my own thoughts about the issue—and by no means to exhaust the rather vast number of things that could be said about Bunk’Art. As always, insights are welcome. Yesterday, so the official story goes, Albania took another step on a long and painful road of transition, out of the obscure darkness of its communist past and into the light of transparent democracy. A vast underground bunker constructed in 1978—during the country’s socialist period—to house the leaders of state in the event of an atomic attack by the Soviet Union or America has been transformed into museum and artistic installation space that will be open to the public until December 30. The installation opened yesterday, with a ceremony that included speeches by Minister of Defense Mimi Kodheli and Prime Minister Edi Rama. The American ambassador Arvizu and German ambassador Hoffman were present, among other dignitaries. Today some 2,000 visitors (including, as the Albanian media and the Bunk’Art website excitedly proclaim, numerous foreign tourists) made the trip to Tirana’s periphery (in a special, free bus leaving from alongside the National History Museum) to visit the site. The event (again, as enthusiastically reported by the Albanian media) has already begun to receive attention in the foreign media. Perhaps the most salient image from the opening event was of Rama delivering his speech, standing on a stage littered with four concrete domes that recall the thousands of concrete bunkers that inhabited (and in some places still inhabit) even the remotest reaches of Albania’s communist landscape. These concrete domes were colorfully decorated with painted images recalling children’s drawings—floating flowers, puffy clouds, and simple boxlike houses with picket fences. On a backdrop behind Rama loomed the logo for the installation, a semicircle fractured into irregular planes of pure, bright color, with a red door at its center topped by the red star of communism. 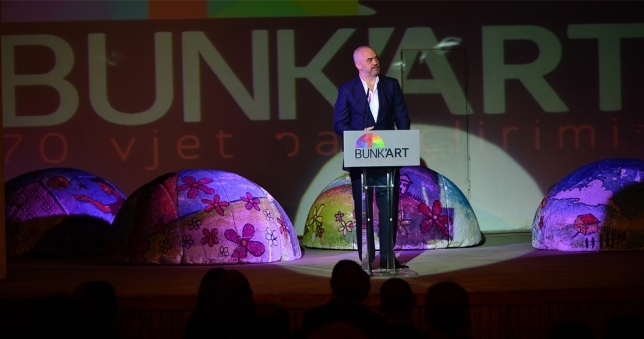 Below this logo, the name of the exhibition, BUNK’ART, was accompanied by the phrase “70 vjet pas çlirimit” [70 years after liberation], a reference to the liberation of the country from fascist occupation. If the connection between the country’s more than 40 years of socialist history and a stage with several concrete bunker-forms covered in childish imagery was not immediately apparent, I can only assume that this was part and parcel of the confusing and confused spectacle orchestrated at the opening (and, it seems, endemic to the installation as a whole). There are certainly any number of insightful analyses to be made of Bunk’Art, and the present discussion is meant to focus on only a few: the diagnosis and treatment of past traumas through the model of the touristic itinerary and the infantilization of the notion of collective memory in the process of navigating this itinerary. Insofar as I find it difficult to find a spot to begin an analysis of Bunk’Art, even having set the above limits upon my investigation, I would like begin rather arbitrarily with a curious translation. During his speech, Edi Rama made the (tremendously fraught) statement, “Sot, ne jemi dëshmitarë se kemi çelur derën e një thesari të kujtesës sonë kolektive.” [My translation—certainly a bit awkward: ‘Today, we are witnesses to the opening of the door to a treasure of our collective memory.’] When the BBC reported on the event, Rama’s speech was glossed with this quotation: “We have opened today a thesaurus of the collective memory that presents thousands of pieces of the sad events and life under communism.” Now, the term ‘thesaurus’ does literally mean ‘treasure’, so that the translation of the word ‘thesar’ (Albanian for ‘treasure’) is understandable, if awkward and not, I think, true to Rama’s intention. Nonetheless, this confusion—emblematic of the whole confusing scenario of the opening and the installation in general—is a productive one, since it invites us to consider Rama’s quotation more closely. For what could be more appropriate than the image of past not as treasure but as a treasure-house of words, of concepts, and what more fitting counterpart to the confusion of the installation’s concept than he image of flipping through a thesaurus, looking for the right words, getting lost in a sea of synonyms and losing any straight line of thought. The most cynical response to Rama’s statement—and the obvious one—is to pass it off as evidence an undisguised and callous greed: Bunk’Art, already a hit with Albanians and especially with foreign tourists, if we can believe the media, is a ‘treasure’ in the most banal sense of the word: a source of actual and symbolic/cultural capital on the world stage. Cynical though it may be to take this reading, it is also, I think, very much what Rama is getting at. In his speech, he asserts, “Këto mjedise janë trashëgimi e një kulture të jetuari që, ju siguroj, do të tërheqin shumë herë më tepër turistë sesa ç‘mund të tërheqë ajo Shqiponja e tmerrshme që kanë vendosur tek rrethrrotullimi i doganës.” [‘These premises are the inheritance of a cultural way of living that, I assure you, will draw a good deal more tourists than that awful eagle at the traffic circle at Dogana [imports].’] On Twitter, the day of the opening, Rama declared “Bota e nendheshme e diktatures do kthehet ne nje haperise atraksioni historik, kulturor e turistik pa asnje dyshim” [‘The underground world of the dictatorship will, undoubtedly, turn into a historic, cultural, and touristic attraction.’] Thus, the language used by Rama (who has, in the media, already become the de facto curator and author of the exhibit, despite the fact that the idea has numerous sources and has been under discussion in a number of circles for some time) describe the opening is that of history-as-touristic-attraction. This is the ‘treasure’ of the bunker and the collective memory it supposedly embodies. I am being more than a little unfair, for I am attributing to Rama’s rhetoric a confusion it may not really contain, that between history and memory. However, it is undeniable that the two intermingle in Rama’s speech, sometimes emerging as interchangeable and other times as separate. The question of collective memory will concern me below; what I wish to examine first is the idea of traversing history (one’s own history, or another’s) as a touristic endeavor—for that is precisely how Rama characterizes Bunk’Art. “Është vetëm fillimi sepse ne kemi një projekt për të krijuar një intenerar historik dhe turistik të nëndheut komunist dhe njëkohësisht për ta kthyer këtë intenerar, në një intenerar të imagjinatës krijuese, duke synuar nga njëra anë çlirimin dhe nga ana tjetër pjellorinë e kujtesës sonë kolektive.” [This is just a beginning because we have a project to create a historical and touristic itinerary of the communist underground and at the same time to turn that itinerary into an itinerary of the creative imagination, with the goal of both liberating and harnessing the fecundity of our collective memory.’] The project of coming to terms with the past is the project of establishing a touristic itinerary—what could be more profoundly and problematically Modern than this project? Were not many of the exemplary Modernist projects (we need only think of the relationship between the colonial, the primitive, and the past in so much Modernist cultural production) precisely the projects of ‘tourism of the creative imagination’? Now, Rama emerges as the quintessential Modernist-as-statesman, a role he has long courted (though I think he has never been forthright about its modernity—for it is, I think, in no way ‘post’-modern). The Modern touristic itinerary is certainly open to a number of different ‘tourists’—from foreigners, to Albanians living (or born) outside of Albania, to those who live within in the country, and who may or may not remember the Hoxha years—but what is unavoidable in this model is the transformation of history—lived or otherwise—into capital fueling the global tourist industry. Tourism has been an important aspect of Rama’s time in office—his policies have often been focused on Albania’s coastal regions, but here the language of touristic development falls squarely in line with a project to mine the imaginary of a people (here conceived as having such a unified imaginary, or ‘unconscious,’ if you prefer). As he puts it, the hope behind Bunk’Art is ‘to create new spaces: new spaces of the imaination, of thinking, of living together, through the power of art.’ [“…për të krijuar hapësira të reja [:] Hapësira të reja të të imagjinuarit, të të menduarit, të të bashkëjetuarit përmes fuqisë së artit.”] This is certanly a worthy goal, and one in keeping with Rama’s prior projects, at least at the level of its rhetoric—what is new is the idea that the primary way to orchestrate this encounter is through the vague distance and ignorant enthusiasm of the tourist: not just the tourist of someone else’s past (that is an easy enough position, I can tell you, as someone who has often been a tourist in Albania), but as the tourist of one’s own past. It is not only the transformation of the encounter with (communist) history into a touristic itinerary that is key to Rama’s project—it is also held together (insofar as it holds together) by a psychoanalytic model of collective memory, as I have already mentioned. Thus, traversing the itinerary of history is more than a simple hermeneutic exercise; it is self-diagnosis, self-diagnosis of the collective of its own imaginary, through the consumption of the past-as-commodity (in this case, the communist past as commodity). The ideal consumers for this commodity, however, are not so much adults—in Rama’s rhetoric—as children. Here (what I can only imagine to be) the logic of bunkers decorated with childlike drawings becomes clear. Rama makes it very clear in his speech that Bunk’Art is, in an important way, ‘for the children’—for those who cannot remember the time of communism, who cannot understand what the isolation of communism was like. Thus, in a way, Bunk’Art as an itinerary is not only about the Modernist project of tourism—it is also about the Modernist ideal of a return to youth, to innocence, to ignorance of the past that only adults can know. And yet here we come to the impasse: if Bunk’Art is about coming to terms with history, how can it also be for those who did not live that history, who do not remember it, unless the goal of its diagnosis is to make its tourists children, so that they may both forget and be taught again how to remember? In other words, collective memory will be most effective when it returns to the imagined zero-point of childhood, among the flowers and puffy clouds and box-houses, and then consumes history as touristic itinerary. From this perspective, what seems ‘infantile’ about Bunk’Art—the fanfare, the bright colors, the bright lights, the confusion, the desire to do everything all at once—must be considered quite intentionally so: part of its explicit goal it to infantilize the collective memory of the Albanian people. I intend to return to these thoughts in the coming week(s), but for now they stand as they are—a call to think critically about Bunk’Art and what it means to treat the past as tourism, to infantilize memory. The tunnels were begun earlier, in 1972. Several news clips show Rama guiding Arvizu through the various rooms of the bunker, explaining them (in English to Arvizu). One can only assume that some pun on communist dictator Enver Hoxha’s assertion that Albania was a “fushë me lule” [field of flowers] was intended. This is not the place to enter into a deep discussion of the way the communist past has been and is being appropriated as cultural capital in Albania. Suffice it to say that—unsurprisingly—this practice is very much ubiquitous at the moment. There are others more qualified to comment on this at length and in detail than I am. This too is a debate that I prefer not to enter into here—so I will instead merely gesture at its existence and go blithely about my way. Most recently, at Creative Time, Rama trotted out his now rather repetitive tale of his time as mayor of Tirana and his artistic projects there. One (read: I) feels an almost painful nostalgia for those days, looking at the image of him standing before flowery bunker-forms. Apologies are no doubt in order for the truly egregious use of italics. In case it is not clear, I am quite suspicious of all claims of collective memory, and I am not claiming that Rama’s project ‘distorts’ some ‘true’ collective memory—rather, it is one way of most assuredly creating it. the problem is that this is not how it is being discussed. 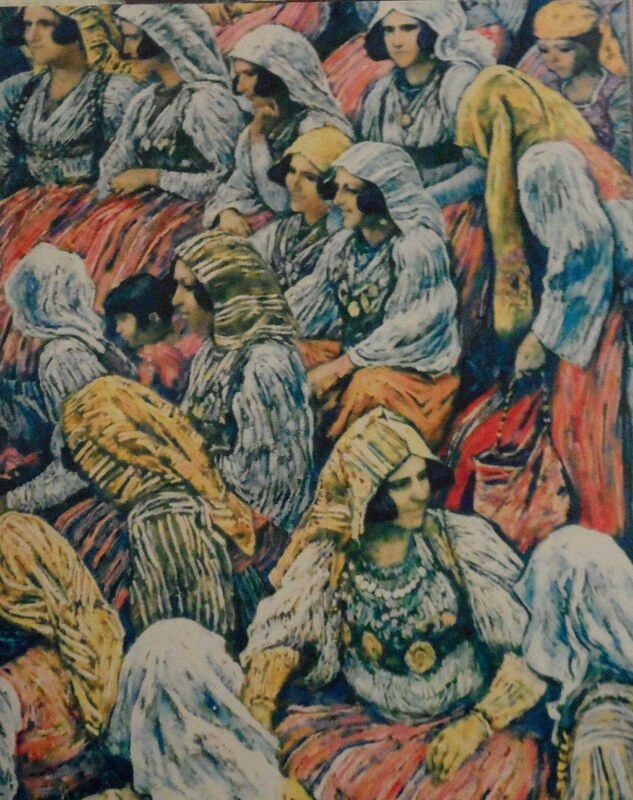 This is the fourth in a series of posts containing PDFs of texts that may be of interest to those studying Albanian socialist realism (and 20th-century art in general, because socialist realism is some of the 20th century’s most intriguing art). Initially I had planned to write thorough descriptions and analyses of the content of the documents, but I barely have the time to scan them, much less write extensive commentaries. Wherever one looks in Albania, one sees a landscape of stone, of marble, a landscape of bronze. It is the new landscape of the fatherland. I think it is important to consider how these two landscapes reinforce each other, and work against each other, in the history of Albanian communist (and post-communist) art. 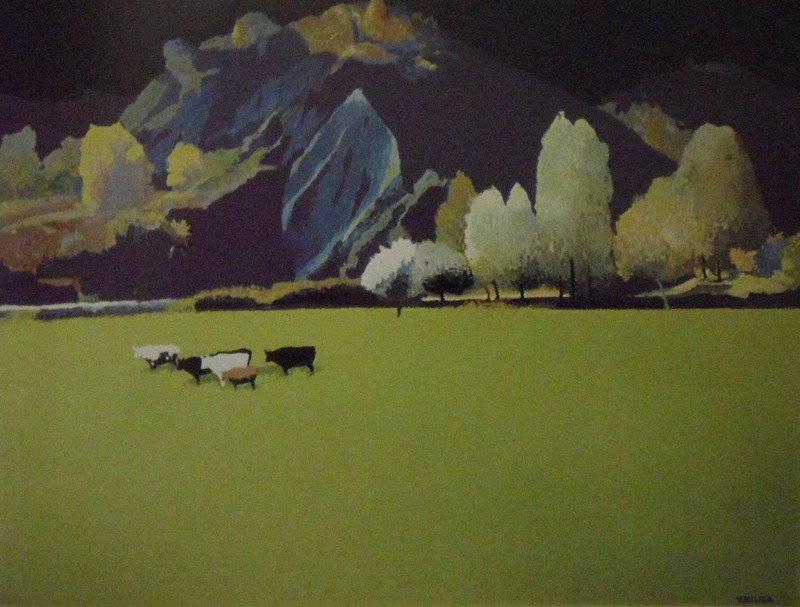 The Nëntori volume also includes Sterjo Spasse’s essay “Epoka që më Ndriçoi Udhën e Krijimtarisë [The Epoch that Lit My Creative Path]”, and a review of a retrospective show dedicated to the painter Sali Shijaku. As part of a recent project, “Talking Back to Dictators: Reading Art and Culture In, Through, and Against the Writings of the Great Leaders,” I’ve been spending more time thinking about representations of dictatorial bodies—and particularly the body of Enver Hoxha, Albania’s communist dictator. This observation grew out of this research. As always, thoughts are welcome! In this brief essay, I would like to nuance a commonly made observation about the representation of Enver Hoxha in paintings produced during his regime, namely: that he does not cast a shadow. This observation, on the whole, is quite accurate, and my purpose is not to dismiss it, nor to suggest that it does not raise a plethora of important questions about the material and metaphysical status of the body of the dictator. However—like all good observations—it is not absolutely true, and I think we may learn just as much by looking at these cases in which it is not true. In particular, I want to consider the significance of the shadow cast by Hoxha’s hand in Spiro Kristo’s Shoku Enver Hoxha Gjatë Luftës Nacionalçlirimtare [Comrade Enver Hoxha During the National Liberation War], of 1974 (originally in the Museum of the Ministry of Internal Affairs; I am unaware of its current location). Before I discuss Kristo’s painting, however, I want to begin by considering how the phenomenon of Hoxha’s immateriality manifests itself in Albanian socialist realist painting. Let us a classic image of Hoxha: Zef Shoshi’s official portrait, which was frequently reproduced in official publications, especially in the editions of Hoxha’s writings. 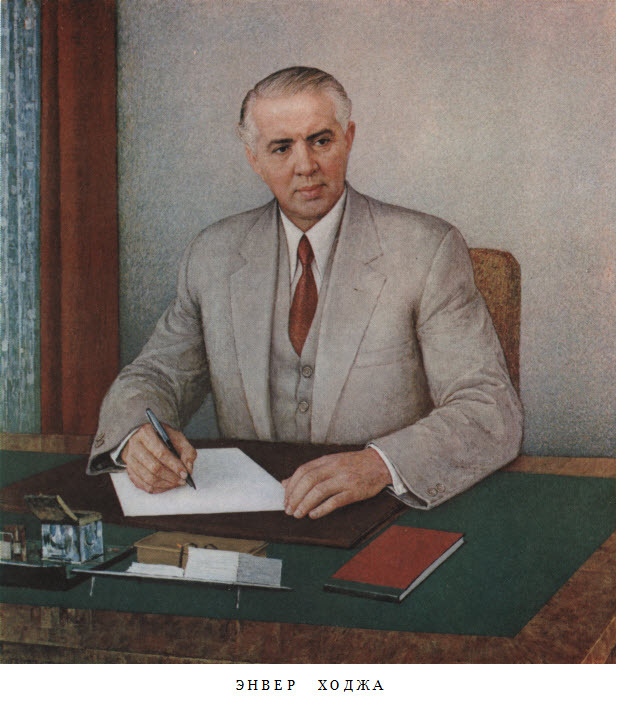 In Shoshi’s image, Hoxha sits at his desk, dressed in his familiar grey suit and red tie. Hoxha’s upper body forms a stable pyramid, his hands resting gently—weightlessly—on the surface of his desk, which holds a number of carefully placed and clearly delineated administrative accessories. We come upon Hoxha as he is about to write: his right hand holds a pen to a blank sheet of white paper laid out before him on the desk. He appears either deep in thought or else suddenly distracted: his gaze looks out of the image to our right, missing us. The moment is uncertain: is he composing the first word of a letter, an official memorandum, an entry in his diary, mapping out the text in his mind before he begins to write? Or has he been distracted by some stray thought, some sound, perhaps even by the entrance of someone who has come in behind us to bring news to the Dictator of the Proletariat. In either case, Hoxha’s poise is exemplary: his face betrays neither the strain of thought nor surprise. His eyes are open and attentive, their darkness in contrast to the muted grays of his suit, hair and the wall behind him drawing us to ponder the purpose behind his look. On the desk before him, his left hand gently holds the upper left corner of the page in place, while his right hand rests just as gently upon the paper, holding a pen close to the surface of the center of the sheet. In no small part, the perceived weightlessness of Hoxha’s figure comes from the fact that he casts no shadow. True, the light that bathes the room comes from no definable source (though it illuminates the right side of the dictator’s face more than the left), but nonetheless there is no trace of a shadow cast on the wall behind Hoxha, either by his body or his chair. Furthermore, at the point where Hoxha’s hand meets the paper, pen gripped firmly and purposefully, there is only the vaguest hint of a darkening in the white surface of the paper. Even at the very edges of Hoxha’s right hand, Shoshi’s soft and meticulous shading gives virtually no hint that the dictator’s hand exists as a material form obeying the laws of illumination. That Hoxha casts no shadow places him in a world apart from us, either more or less real than ours (or both at the same time). This is, undoubtedly, the standard for images of Hoxha produced during his regime: a brief survey of portraits and history paintings by Vilson Kilica, Sali Shijaku, Shaban Hysa, Kujtim Buza, and others will confirm that Hoxha never casts a shadow. Or doesn’t he? The first thing to be said, an issue I think is extremely important but which I do not wish to dwell upon here, is that figures in socialist realist paintings more often than not do not cast shadows in general. Thus, Hoxha is part of a general rule. However, it is more fruitful to consider the counterexamples that prove this rule, one of which is Spiro Kristo’s Shoku Enver Hoxha Gjatë Luftës Nacionalçlirimtare (1974). 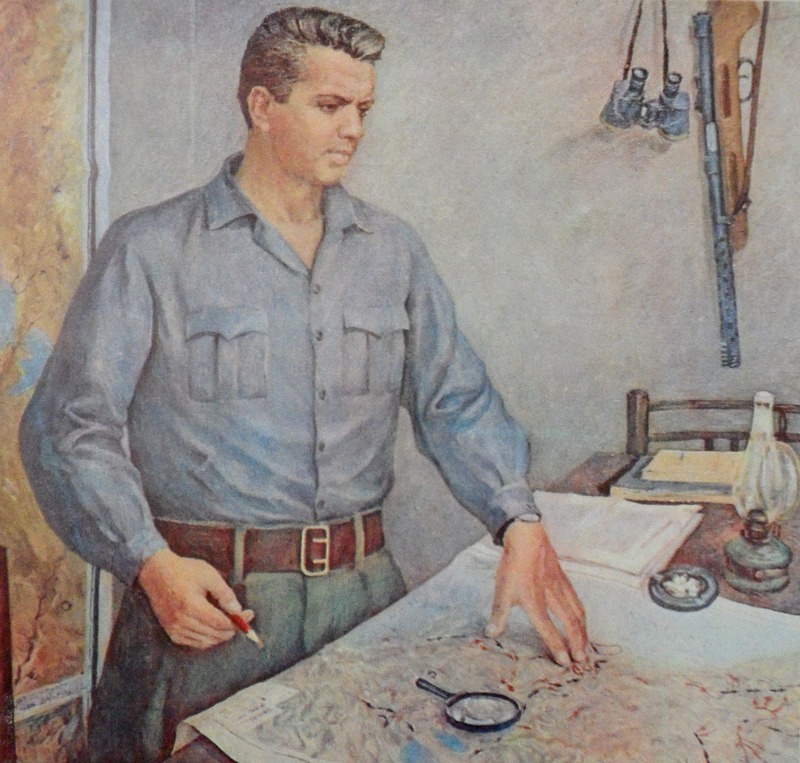 Here, we see Hoxha as a young commander, presumably in the headquarters of the resistance: he stands at left, a map at his back and a table before him, where his left hand rests on yet another map. A rifle and binoculars hang on the grey wall to his left, and documents, a lamp, an ashtray, and notebooks clutter the surface of the table. The lighting here is once again quite vague, but the source clearly comes from the upper right side of the canvas, high over both our and Hoxha’s heads (not at all from the lamp at the desk). 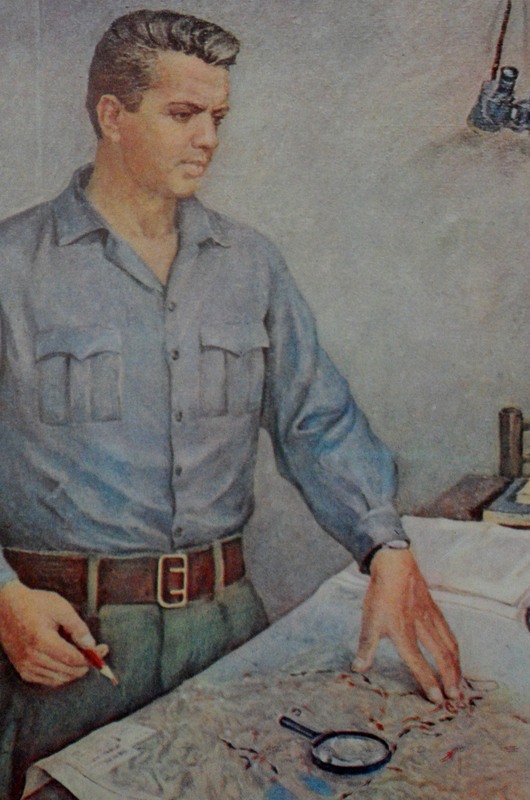 The map on the table disappears out of the frame at lower right, while its bottom edge is folded over the edge of the table against which Hoxha stands. A magnifying glass rests on the map, and black and red arrows mark the movements of the occupiers and the resistance. Hoxha holds a red pencil in his right hand, lax, while his left is firmly planted on the map, at a swirling cluster of arrows (presumably near Tirana). And there is the shadow. It is slight, let us make no mistake, but also distinct: here, at the tips of Hoxha’s fingers, Kristo has used the deepest black found in the image, present in only a few other places (the black arrows on the map, a few folds of Hoxha’s shirt, the shadows in his hair…). The shadow is quite necessary aesthetically, for it differentiates the flesh of Hoxha’s hand from the colors on the relief map. At the same time, it accentuates the tips of his fingers, which end the dynamic diagonal downward movement of his straightened left arm; the fingers are pressed so firmly against the map that their joints bend inversely, the index finger concavely and the knuckle of the middle and ring fingers convexly. Even the tip of his thumb, pressed to the map, casts a small but distinct dark shadow. If the hand, and its shadow, are necessary to link Hoxha’s monumental body to the map itself, this is also the case because his gaze (in some ways, similar to Shoshi’s portrait) is not focused on the surface before him, but gazes off the right side of the canvas, looking at something we cannot see. As above, Hoxha seems to pause suddenly in the midst of an action, caught up in thought, looking at nothing. Here, however, his body is anchored to the map, and it takes on a material aspect through its connection to the map, where it casts a shadow. Why the map? 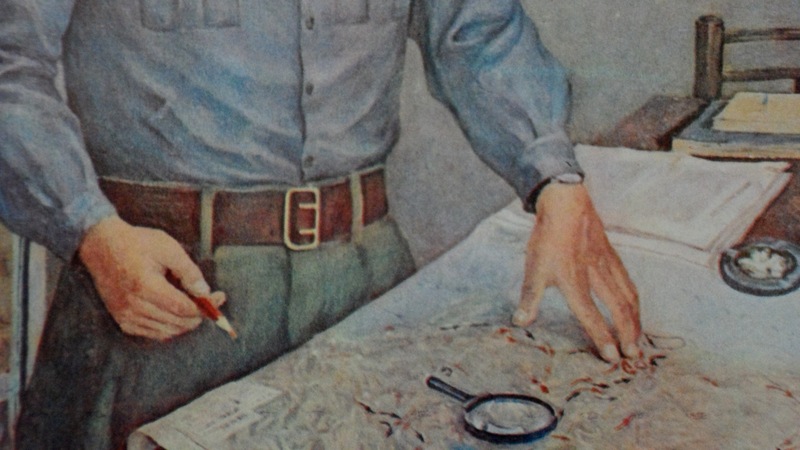 I want to argue that Kristo’s emphasis of Hoxha’s hand as a material object touching the map is not accidental. 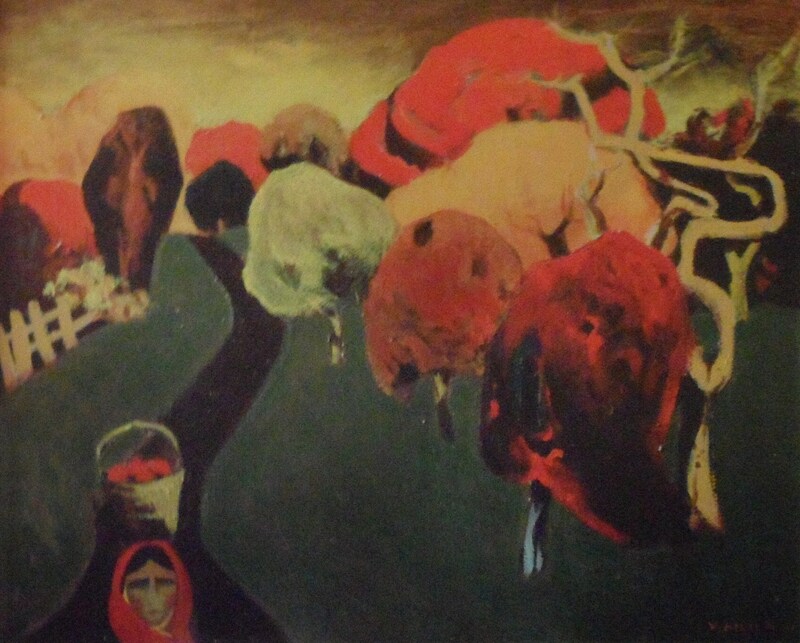 What Kristo depicts is the becoming-material of Hoxha’s body in the presence of the representation of Albania. If we place the image alongside a host of paintings in which Hoxha’s feet, planted firmly upon the soil of the fatherland, cast no shadow, the significance will become clearer. The dictator does not become material when his feet touch the earth, he becomes material out of that most simulacral of simulacra: the map of the territory that does not yet exist (the future socialist ‘utopia’ of Albania). In this case, we might say that it is the map that precedes the dictator: out of the swirling represented motion of troops on the map, out of the flat surface made to mimic dimension, Hoxha emerges as something tangible. He is not simply historicized (his role in the war made the key element of the so-called National Liberation War [WWII]); his ‘reality’ (in the haptic sense) is a function not of the nation itself (whatever that might mean), but of the sign for the territory of the nation. is existence becomes material not at the level of interaction with everyday objects so much as at the level of meta-representations of the world. Kristo’s painting, and his depiction of the dictator’s hand with its shadow, gives us a glimpse of Hoxha taking material form in the higher realm of maps, the realm of surfaces and images that precedes our own. Is it any wonder that amongst us, before us, at his desk about to write, he casts no shadow? For one discussion of the metaphysical significance of Hoxha’s body and the realm of appearances, see Gëzim Qëndro, Le surréalisme socialiste: L’autopsie de l’utopie (Paris: L’Harmattan, 2013). Stylistically, this is no doubt in part due to the tremendous debt owed to Impressionism, where intense light and dark give way to light as pure colors. This cannot of course fully explain the ideological significance of a world without shadows. This is also, I think, important: we see Hoxha here before his apotheosis: he is nothing superhuman, or beyond human, quite yet. Of course many images depictng Hoxha in the war years show him without a shadow. Some however, like this one and Guri Madhi’s Formimi i Shtabit të Përgjithshëm, portray parts of his body casting a shadow.